Photo: Copy of framed photo in the dining room at the home of my sister Louise and her husband Frank Yochim. This is Franks Cold Lake Marina as it looked in the late 1960s after being moved to the Main Dock. For thirty years my brother-in-law, along with members of the family operated the Marina and following his retirement, his son Lorin Yochim took over for several years before heading out to explore the world. Link to Next Post: DHC-3 Fish Attack. Photos: Mr. Labatt, left, and Mr. Z.A. 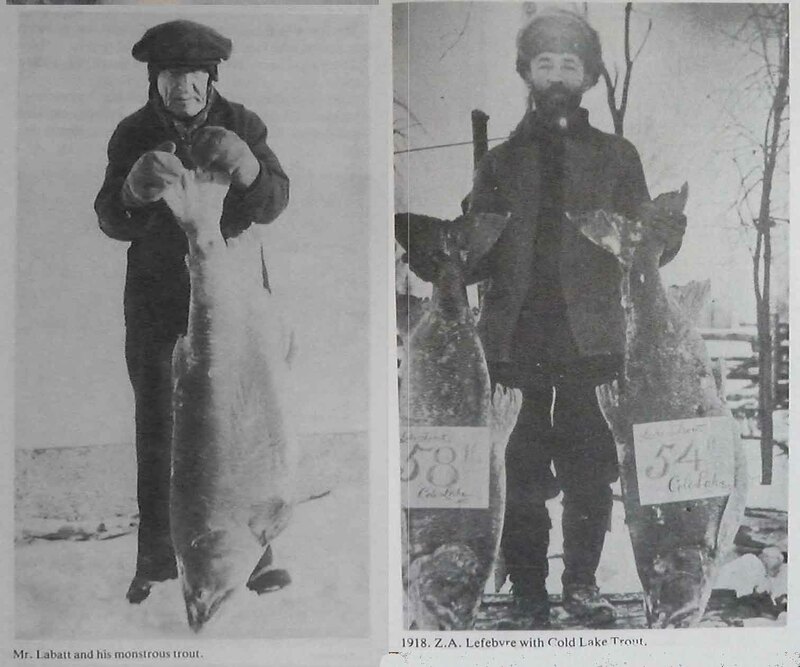 Lefebvre, with three monster trout caught in Cold Lake between 1915 and 1918. It is not hard to imagine there were, and still are, fish larger than these in Cold Lake. Pictures were copied from “Treasured Scales of the Kinosoo”, a compilation of the history of Cold Lake by Laura Dean Skarsen. Many who arrived in Cold Lake early in the 20th Century to take up the search for the Big Kinosoo, decided to stay. Many became trappers, loggers, farmers, cattlemen, while others opened businesses in order to raise money to continue their search for the big fish. In their search they caught many other big fish, but never the Big Kinosoo. He was, by all accounts, one very elusive fish. 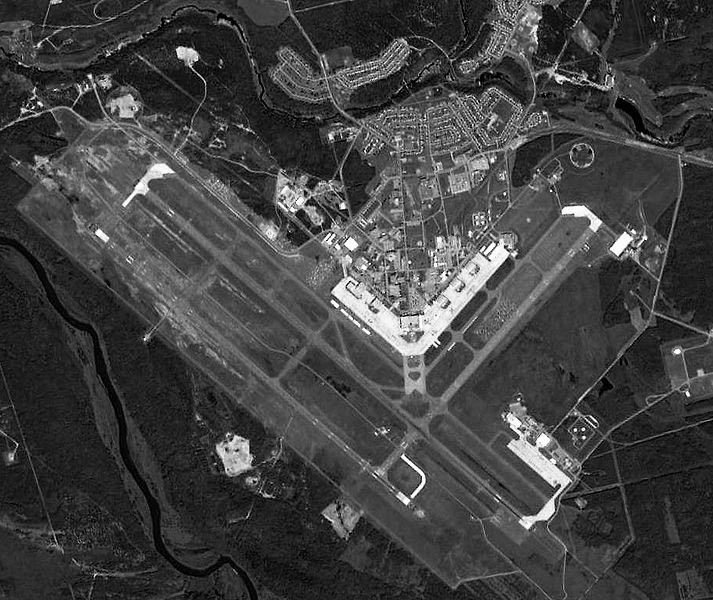 By the middle of the century, many new residents were taking jobs building the new Canadian Forces Air Base west of town. Still later, hundreds of these workers accepted more permanent positions when the base became operational. The base continues to this day as one of the largest training bases in Canada and is a the centre for a large NATO training operation. Both my mother and father were part of the work crews that helped build the base – mom as a cook and dad, first at Primrose, building radar stations, then, when the base was complete, with the Construction Engineers Section (CE). In the final decades of the last century others rushed to the area believing a high paying job in the oil patch would provide the needed riches needed to continue their search for that big fish. Today, a boat, RV, SUV and an ATV sit in many driveways suggesting the dreams of a bygone era have not changed. For many Cold Lake residents, the search became a lifelong obsession taking up every spare minute. Having grown up in Cold Lake during the 1940s and 50s, my friends and I, like our parents, were avid fishermen and were well versed in the legend of the Big Kinosoo. However, exhibiting the usual exuberance and recklessness of youth, we paid scant attention to the dangers that lurked beneath the dark surface of those cold waters. My dad, a man who held no fear whatsoever of the backwoods or the lake, always carried a 30-30 rifle “just in case”. Having lost several gill nets to that big fish over the years, he believed a high-powered rifle would be the only way of turning back the monster if it decided to attack. That simple precaution taken, my dad became a skilled commercial fisherman. Fish were so plentiful during the early years it was not uncommon to see dad’s 60, 80 and 100 mesh gillnets1 floating to the surface so engorged with fish the bottom weights (sinkers) were no longer able to hold the nets down. 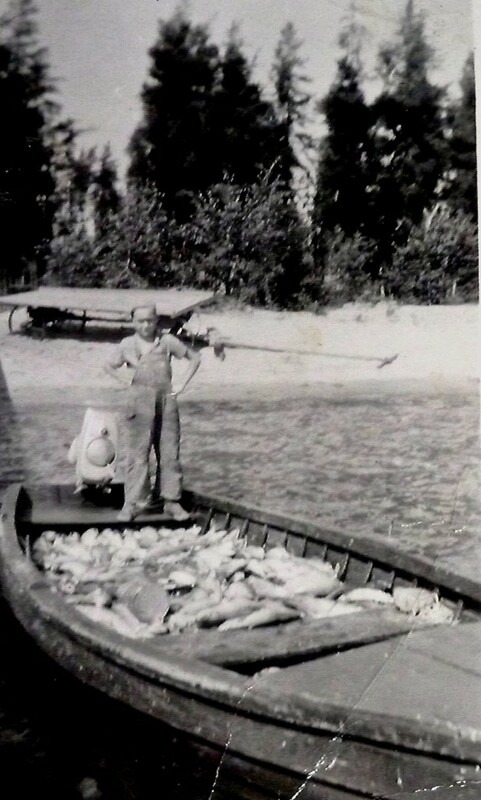 Photo (Mom’s Photo Files): Mom snapped this photo when Dad and I returned from a fishing trip on the North Shore of Cold Lake in the late 1940’s. Sometimes when the weather was rough some of the fish might even was over the side as we neared shore in the breakers. On one occasion when returning from pulling the nets, the boat was so heavily laden with fish it swamped in the shallow waters of North Bay just as dad and Uncle Warren were making their way to shore in rough water. The whole family waded in to help recover the fish which represented a small fortune in days when Jackfish could fetch 20 cents a pound, Whitefish, 30 and Pickerel 402. They were heady days, as even the most inexperienced sports fishermen often returned with a boat full of fish. With fish so plentiful, few worried about daily limits. Stories about the “big one” that got away, continued to spread far and wide. It was not uncommon for people to drive nine, ten or more hours on a weekend just to catch a few hours on the lake. 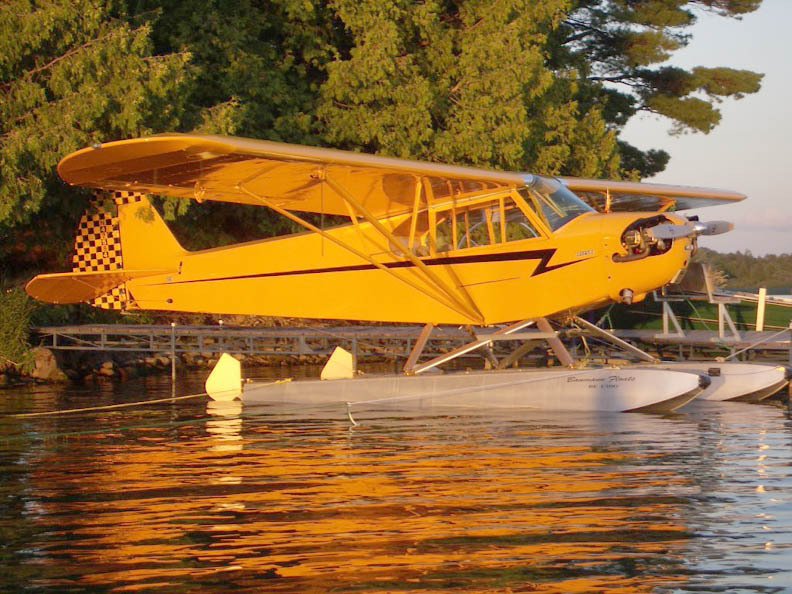 Many owned or rented small floatplanes in order to cut down the travel time. 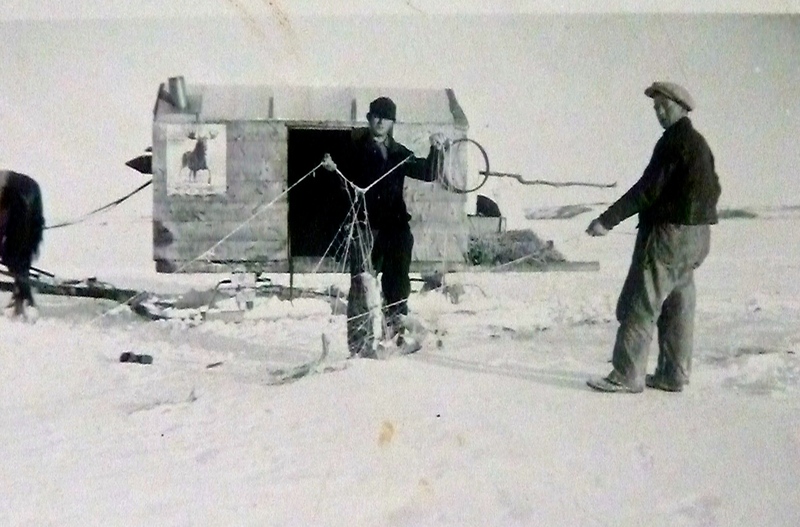 When the lake froze in the winter, sports fishermen dragged little huts onto the ice and braved blizzards in -40 in order to continue their quest. Photo (Mom’s files) In the early years dad and other commercial fishermen used canvas covered cabooses on a horse drawn sleigh in order get to get to their favourite net setting spot. In this photo Dad is facing the camera. The caboose in the background always had a wood stove burning so that on extremely cold days, the men could pop inside for a coffee and bowl of hot beer stew. In later years, many men began used trucks to tow a cabooses and some even built shelters in the box of their pickup. These shelters were also equipped with a wood stove and sleeping area so the men could live comfortably on the lake for several days at a time. There was also the danger of open stretches of water forming around heaves. Some believed the heaves were caused by changes in the weather (warming and cooling) while others, with more experience, were certain the heaves were caused when large a fish, perhaps the Big Kinosoo, taking a run at the ice in order to scare the fishermen off. If the cracks were covered by drifting snow it was easy to break through. More than a few fisherman ended up putting their horses or truck through the ice. Note: These two photos of fishing scenes are used with kind permission of Selmer Aussland and may be viewed at: www.jkcc.com The scenes exactly portary images of my father and his friends as they summer and winter fished on Cold Lake and surrounding lakes. Dad had once watched his team of horses fall through about 100 feet offshore below the Lakeview (earlier known as the Bellville) Hotel and, as well, my Uncle Warren (Harwood) and cousin, Emerson (Dewan), put their vehicle through the ice of Marie Lake.4 While my dad, his horses, Warren and Emerson survived, others, over the years, were not so lucky. Daily, except Sunday, from mid-afternoon to late evening, the two beer parlours, the Roundel and Lakeview, overflowed with fishermen, loggers and trappers telling and retelling stories. In the early years is was a ‘man’s domain’ as women were not allowed. When in town, Dad was a regular at these late afternoon ‘sessions’. Alberta, ever the progressive Province, finally made concessions that allowed women to enter in a separate section referred to as “Ladies and Escorts”. Saskatchewan continued to outright ban women from entering a bar well into the late 1950s or early 60s. Most often women and children waited at home or in hotel lobbies or restaurants while the men socialized. It was an embarrassing moment for a man whose wife or child had them paged by the bartender. Laughter would ring out, accompanied by snide comments directed at the man responding to the page (if he chose to respond). For many men, life became so frenzied with work, fishing and ‘socializing’, the Town Council finally implemented a ‘Bar Closure Bylaw’ that closed drinking establishments between 6:00 and 7:00 pm daily in an attempt to get the men home for dinner with their families. By the late 1950s, so many were chasing the elusive dream of catching the “big fish” that regular fish stock in the lake began to collapse. Only the bottom feeders (Sucker’s, Mariah, etc) and the Big Kinosoo remained. That one big fish, however, was sufficient to keep alive the dream and kept the masses coming in large numbers. It was an intoxicating time! About that time my brother-in-law, Frank Yochim, opened “Frank’s Marina” the first full service marine facility at Cold Lake. Even though the fish catches slowed, the demand for boats and equipment continued at a brisk pace over the next 40 years.6 Frank, and after his retirement, his son Lorin, operated the marina as a family enterprise attracting fishermen and sailing fans from around North America. Both Frank and Lorin were cautious men7 who always sought to ensure marina patrons were made fully aware of the dangers that could arise on Cold Lake. Both were ardent conservationists who firmly supported a balanced approach to use of the lake and the bounty it contained. The final boost to fish stock came when a fish hatchery was built at English Bay and by the end of the 1980s stock had recovered to levels not seen in the previous 30 or 40 years. Not long after that, a new breakwater and Marine Facility were built. Over this period, stories of the Big Kinosoo continued to dominate local, national and international fishing news attracting hundreds seeking to catch the “big one”. 1 The gill nets used by my Dad and others were generally made of cotton or nylon. A 60 mesh net would generally spread to a width of about 12 feet (at 2 ½ inch mesh). The mesh size was dictated by government regulations. The smaller depth nets were used closer to shore (20 feet of water) and the larger depth, of course, in deeper water. 2 One time the boat swamped when the waves washed over the stern of the boat as dad approached the shore. At the time, he was using a small sport fishing boat with a 60 hp Evinrude motor which proved too heavy for the boat when it was filled with fish. 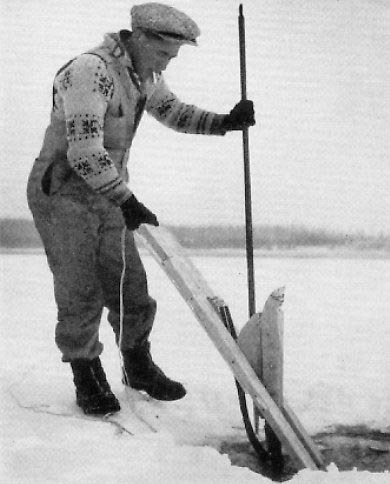 3 The “jigger” was an ingenious device used to draw fish line under the ice for later use to pull in the net. Jiggers were often homemade and brightly colored to be seen through several feet of ice. Obscured by snow, a jigger could be tracked by the “clicking” noise it made when it jumped forward (2 or 3 feet) with each stroke of the line (see schematic below). 5 Johnny Donanco rebuilt a Piper Cub (J3) which he used on floats in the summer and in the skies in the winter to search out poachers. My long time school chum, Aaron Pinsky, and I, often rented this little 65 hp plane from Johnny. Our carefree years of flying this little plane around the lakes and beaches of Northern Alberta will be the subject of other stories. The J3 looked almost exactly as the photo to the left (from the web). 6 Frank built the first Marina outlet on the hill across from the Catholic Church, later moving it to the dock area. This Marina provided a way of life for the whole Yochim family and, indeed, a focal point for our extended families. For nearly 45 years, family members wiled away their summers at either the Marina or at Grandma and Grandpa’s farm (Skarsen) (stories to follow). 7 Do not mistake me when I characterize Lorin as a “cautious man”. That reference is only toward the “duty of care” owed to Marina patrons. In his other life Lorin was, and still is, an adventurer of the first order. One only had to read his colorful travelogues as he traversed the globe in order to gain a glimpse of that young man’s intense interest about the world in which he lives. Due computer crashes and other technological challenges over the intervening years, I am not sure if I will ever be able to recover my copies. If they are, they will be posted on this blog. Note: Pictures of fishing scenes and equipment used with kind permission of Selmer Aussland and may be viewed at: www.jkcc.com The scenes exactly portary images of my father and his friends as they summer and winter fished in Cold Lake and surrounding lakes. Photo: Schematic of jigger. This ingenious little device was a critical part of being able to string nets under the ice. 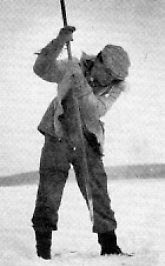 Once the hole was cut and the jigger placed under the ice the operator pulled and released the attached string to propel it under the ice. An assistant would follow the clicking in order to dig a hole 100 yards our to pull it out. The net was then pulled under the ice using the draw string. Photo: When pulling the net from the hole the ice had to be neatly trimmed or it would snag the net. After removing fish any tangles had to be removed before the net froze. piled carefully as it usually froze very quickly. The net would then by pulling it back under the ice using the draw cord that had been pulled in with the jigger. Photo: Fish were often stacked on the ice and left to freeze before they were placed in boxes for shipping. Two kids with their dad coming in from fishing wiht a large lake trout. This scene, taken from Web, is very reminiscent of days spent with dad, mom and Louise on Cold Lake. We all dressed very much like the two kids in the photo although I don’t recall Louise ever wearing a tam as in this picture. 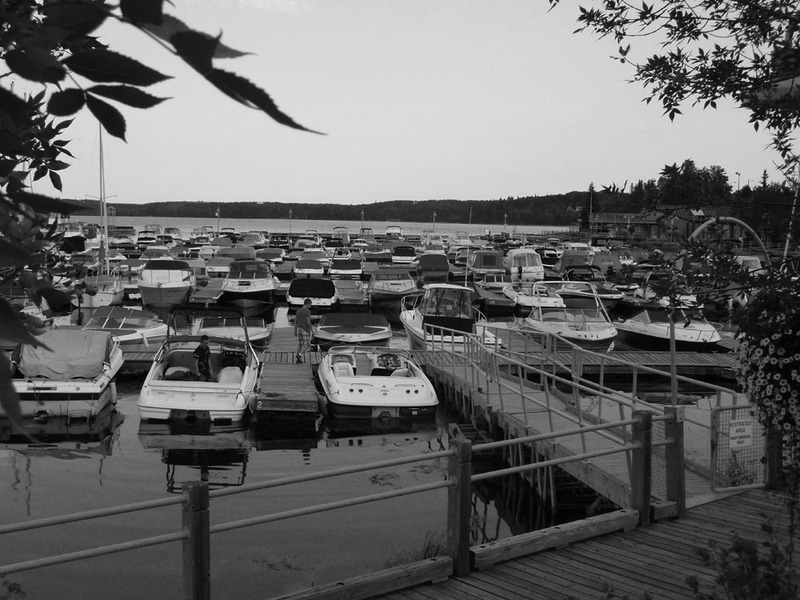 The Cold Lake Marina in the summer of 2009 is as robust as it has ever been. Boaters come in from all over Alberta and Saskatchewan to moore for the summer in order that they might have a chance at catching the “big one”.